Where there is water, there is life. As the longest river in Southeast Asia, the mighty Mekong meanders through six countries before emptying into the South China Sea. From her origins in China’s Qinghai province, the river gains momentum with the inflow of pristine ice melts from Tibet before she transgresses through the Golden Triangle into Myanmar, Laos, Thailand, Cambodia and Vietnam. 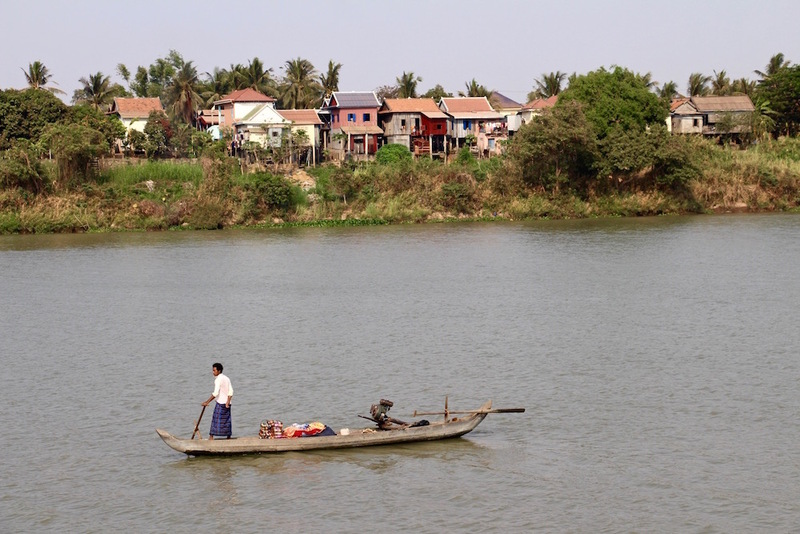 Second only to the Amazon in biodiversity, the Mekong’s 4800 kilometres is home to an abundance of plant and animal life, and is the pulsing vein that sustains the livelihood of 60 million people. Her murky waters teem with more than 850 species of fish, with aquatic giants such as the freshwater stingray and giant catfish growing to almost mythical proportions in her mysterious depths. Life on this great river is best observed from the water, and we did precisely this on board the luxurious Aqua Mekong. 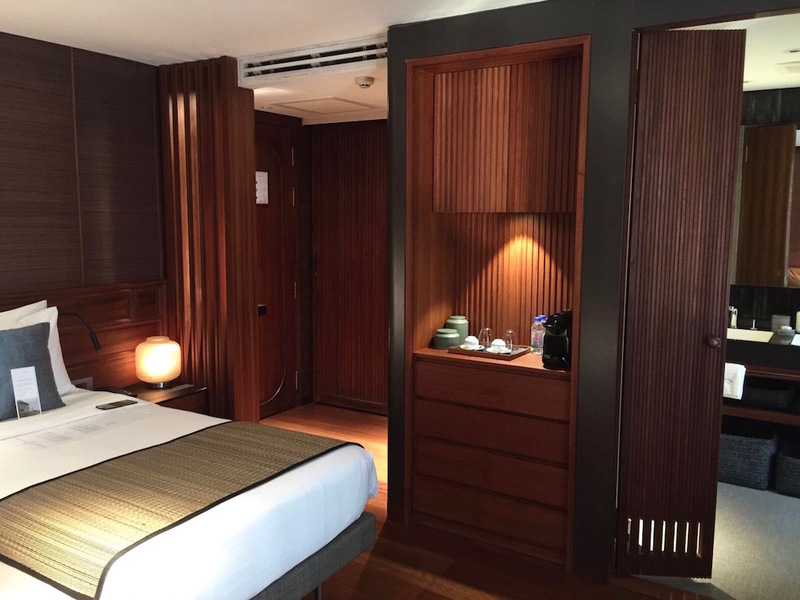 The sleek one-year-old riverboat is an exquisite floating five-star hotel, and can accommodate up to 40 lucky guests in demure luxury. Creature comforts such as a rejuvenating spa, an indoor theatre, a dip pool, a games room and library, plus indoor and outdoor lounges ensure that guests soak up the best of the Mekong in style. Four nimble skiffs whisk intrepid travellers through floating villages and lush river grass to secluded temples and bustling local markets for a taste of life on the Mekong delta. Michelin-starred chef David Thompson of renowned Nahm restaurant in Bangkok is the man behind the menu on the Aqua Mekong. 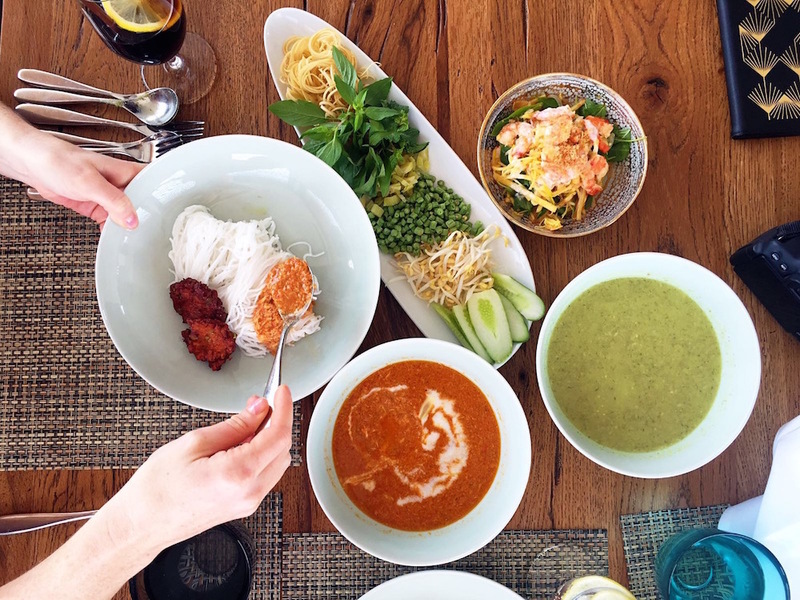 On our three-night “discovery” cruise of the Mekong, David was on board to sail through the ship’s culinary concept with us. A trailblazer in Southeast Asian cuisine, David’s menu reflects the unique produce and traditional recipes of the locale. 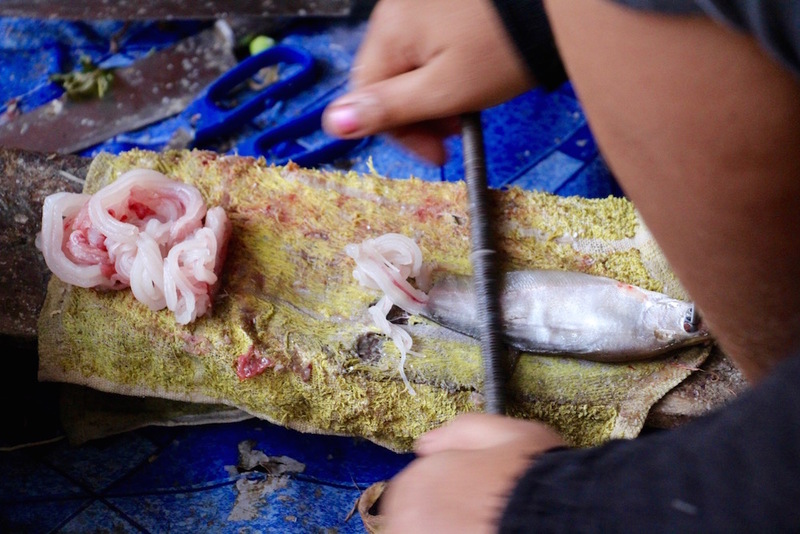 Family-style meals shift from rich fish amok in Cambodia to refreshing rice paper rolls as the Aqua Mekong glides into Vietnam. Each dish serves to enhance the authenticity of the journey. After a rather dusty tuk-tuk ride through Phnom Penh, we arrive at the Elephant Bar in Raffles Hotel le Royal for refreshing bottles of Cambodia’s iconic Angkor beer before boarding the Aqua Mekong. A cool glass of citrusy ice tea and a relaxing shower settled us into our stylish cabins on board the ship, and our first night began with a formal welcome by Aqua Mekong’s captain and crew, followed by a mesmerisingly beautiful Khmer Apsara dance performance. Following a hearty breakfast of addictive buttery pain au chocolat and fluffy ricotta pancakes, we voyaged to a floating village. 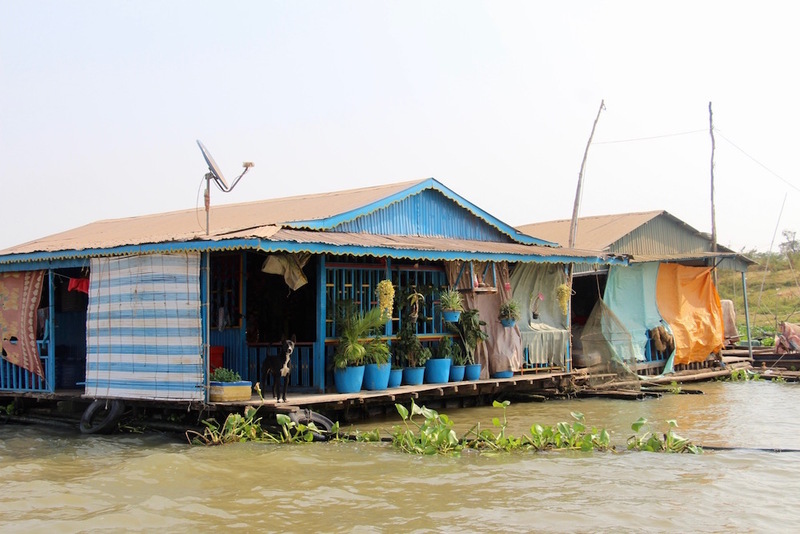 Fishermen anchor their homes on these floating platforms, which rise with the flood during the monsoon season. Each house sits on top of its own fish farm, from which the fishermen supplement their daily catch during low season. Access to these farms are often through a trapdoor in the living room floor! Our next stop was at a silversmith village called Koh Chen, revered as the Khmer royal family’s coveted silverware supplier. 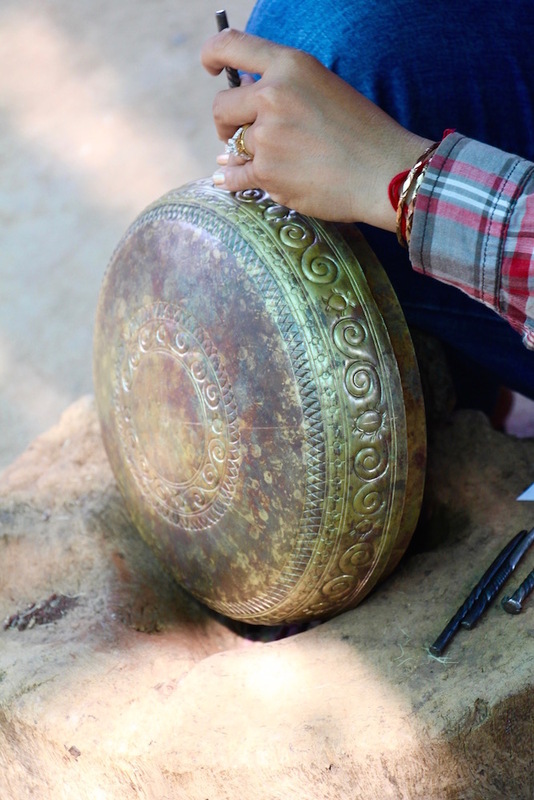 We watched local artisans skilfully pound intricate designs into pure silver pots before visiting a gilded Buddhist temple. After weaving through golden temples to fantastical fables told by our very knowledgeable guide, we watched saffron-robed monks in prayer in a great hall blanketed in vivid murals. During the mercilessly hot afternoon, we took refuge in Aqua Mekong’s relaxing spa for a hour long massage before attending David Thompson’s masterclass. We watched the skilled chefs transform a melon into a blooming flower with a few slashes of a knife, and learned the secrets behind the making of fish amok and Thai crab omelette from chef Thompson himself. 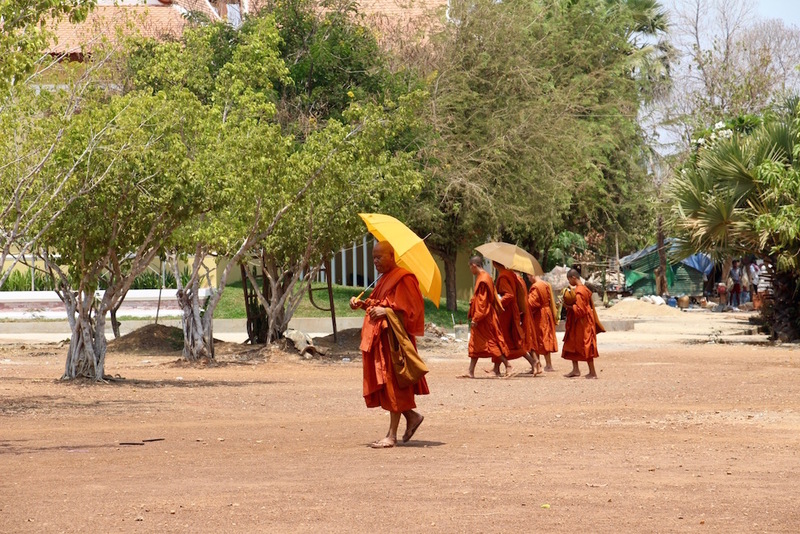 As temperatures cooled in the early evening, we took a walking tour of a nearby village to see how the Khmer people deal with the region’s wet and dry seasons. The solution- build everything on stilts and always keep a boat handy for when the village is overtaken by the river! Throughout our tour, we were followed by giggling children, and we learned that the Aqua Mekong collaborates with the nonprofit organisation Room to Read to set up literacy programs in the village. 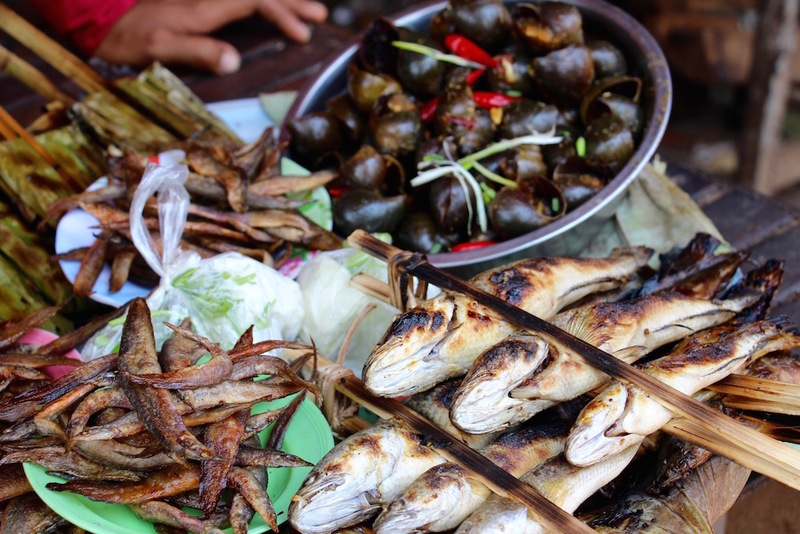 The Mekong is home to some of the world’s biggest freshwater fish. Recently, a 2.7 metre catfish was caught in Mekong waters near northern Thailand. The beast weighed 646 pounds and was as big as a grizzly bear! 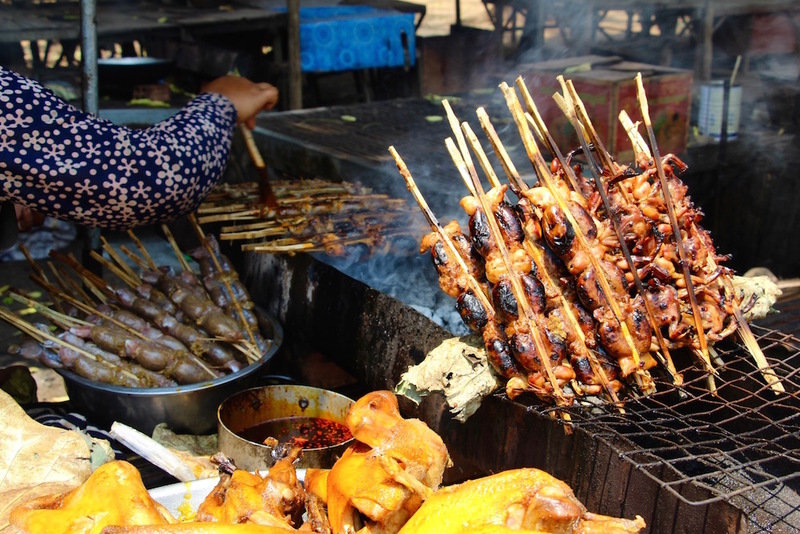 To make the most of the relatively cooler morning temperature, we ventured into the town of Kampong Chhnang to hunt for local produce with chef Thompson. 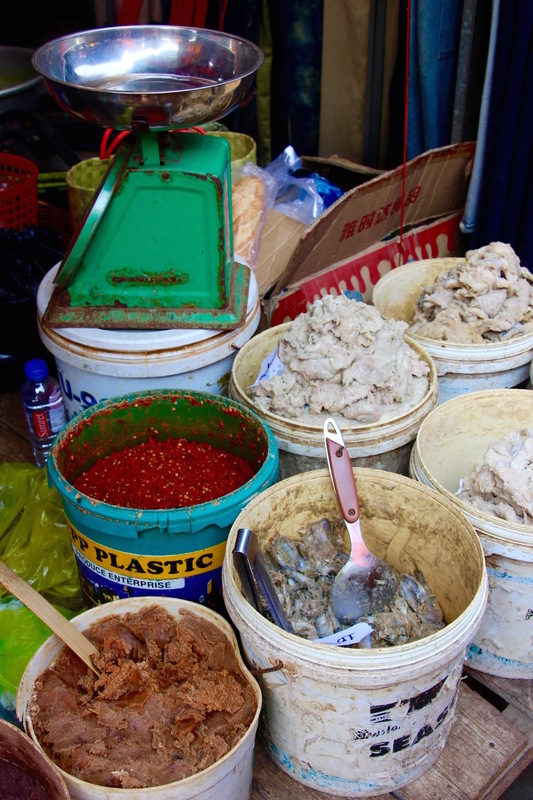 The local market was a labyrinth of unique ingredients ranging from plucked water fowl, to fermented river shrimp, to the very sinister looking snakehead fish. 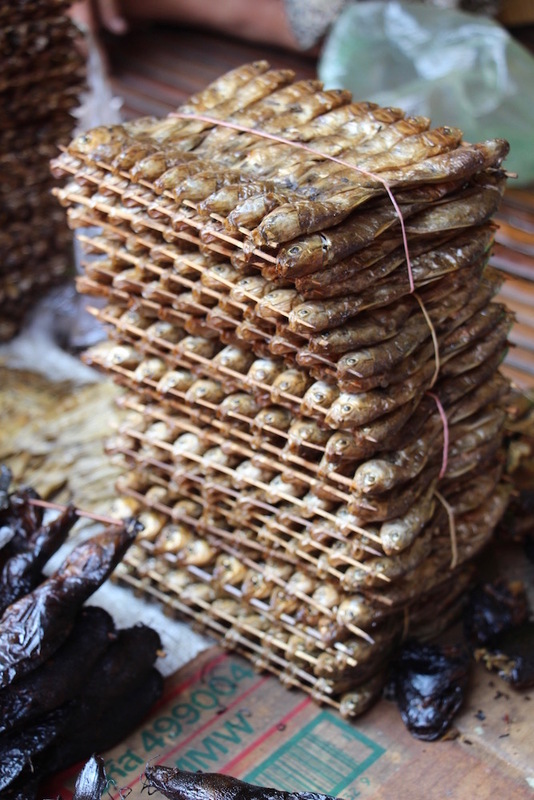 The narrow walkways also teemed with street food from spiced snails to stuffed frogs and juicy palm fruit. 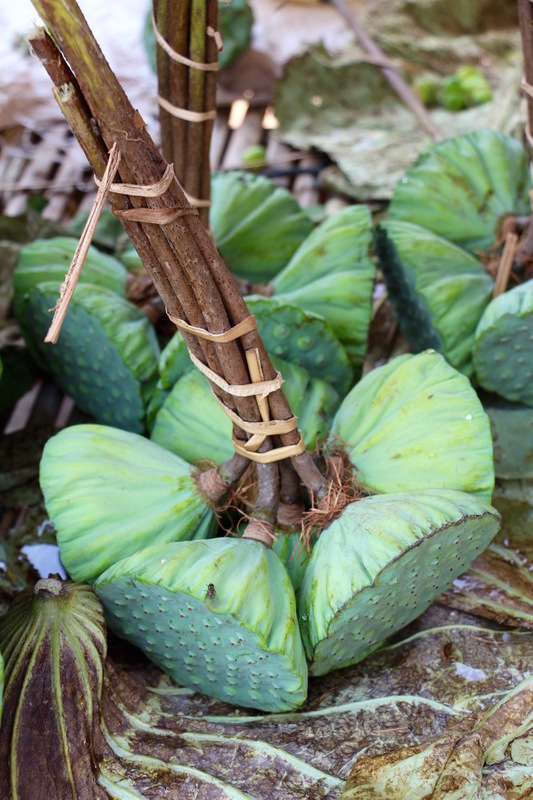 Our favourite was the fresh lotus seeds, peeking out from green pods. 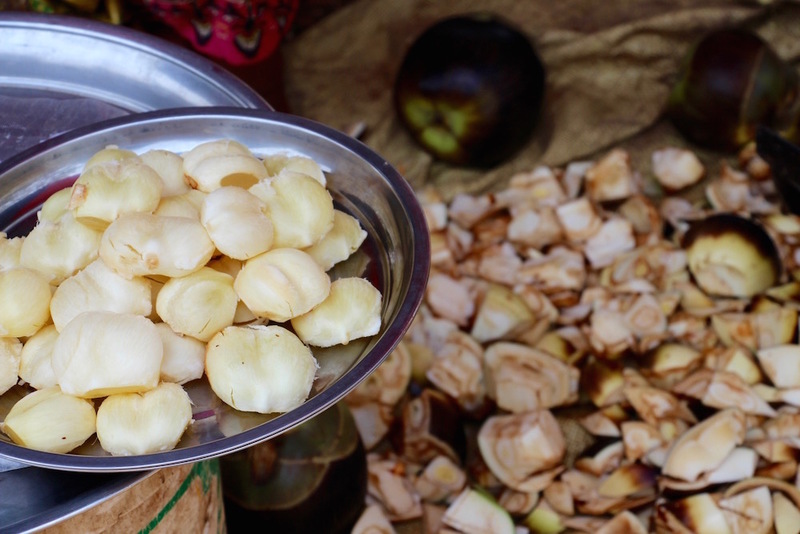 Dried lotus seed is a key ingredient in Chinese desserts, but it was our first time tasting it fresh from the pod. Each seed was subtly sweet with a slightly bitter undertone reminiscent of gingko nuts. It was the perfect healthy snack to go with a chilled Angkor lager! Whilst the sun was still low in the sky, we biked through rice paddies to watch a 72-year old master scale towering palm trees to harvest sap from the palm flowers. The elder definitely knows his way around heights, since he has over 56 years experience climbing these trees. A neighbouring pottery maker showed us how to craft clay pots within minutes without a wheel but rather walking in a circular motion around the pot. It was a brief glimpse of the local culture and a deeply pleasant excursion. On our cruise back to Phnom Penh we stopped at the village of one of the ship’s bartenders, who graciously invited us to his home for a taste of his mum’s home cooking. We were treated to delicious steamed bamboo sticky rice with banana, and sweet pumpkin doused with coconut milk wrapped in banana leaves. Traditional ox carts took us to our sundowner drinks in the midst of a rice paddy. There, we chatted with the field owner and his grandchildren, sipped chilled bubbly and snacked on local spiced beef jerky while watching the sun climb under the horizon on another spectacularly adventurous day. We awoke in the harbour of bustling Phnom Penh. The cruise was a fairy tale journey into the mystic of the Mekong, and an eye-opening experience of life on this great river. Before we bid farewell to Cambodia, we took a whirlwind trip through the city to visit the ornate Royal Palace and National Museum. Cambodia, until next time! Flooding is a highly anticipated event each year, as the rising water disperses rich minerals that make the river delta incredibly fertile. Water levels can increase by eight meters, making stilt and floating houses essential to delta inhabitants. 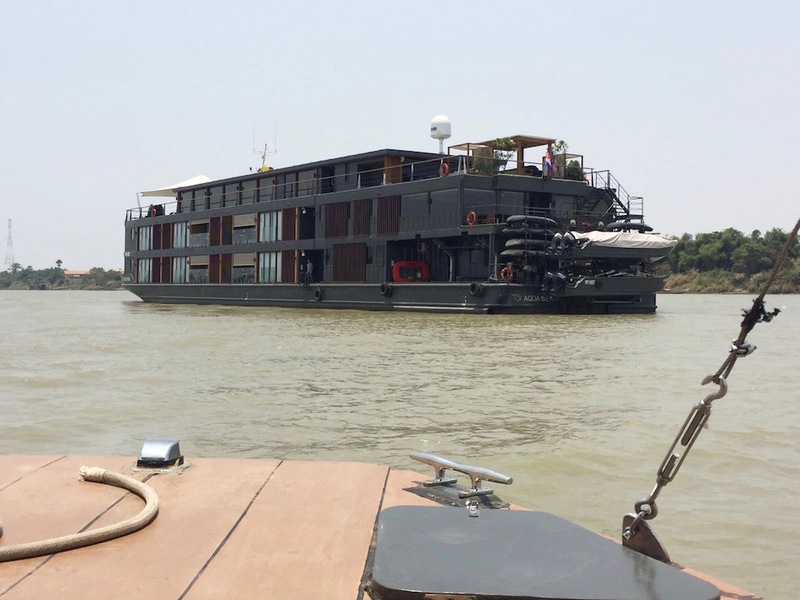 The Aqua Mekong operates year-round between Cambodia and Vietnam, and sightseeing itineraries that rotate depending on high and low water seasons. 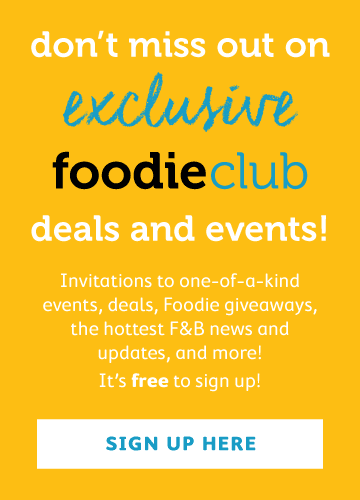 Three trip options are available, ranging from the 3-night Discovery cruise (starting at US$3660), to the 4-night Explorer cruise (starting at US$4880), to the 7-night Expedition cruise (starting at US$8540). There is also two sister fleets under the Aqua banner that run on the Amazon river.